Microsoft's Shift to "Devices and Services": Conflict of Interest? 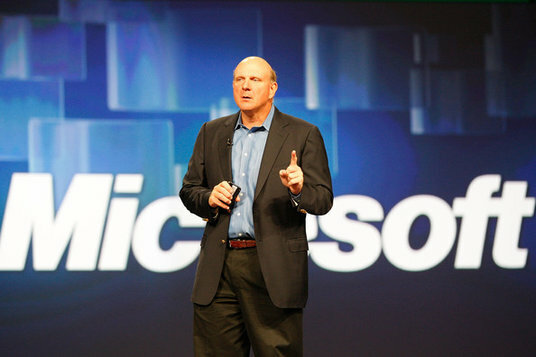 Over the past year, Microsoft CEO Steve Ballmer has hinted at a shift in Microsoft's business strategy, from a software focus to a "devices and services" model. With his letter to Microsoft shareholders, we have the first official confirmation that that is indeed the case. Unfortunately, this strategy also creates a conflict of interest that may cause significant problems. This is a clear message that Microsoft's hardware forays with the Surface tablet and rumored Surface smartphone are more than just "reference designs". "Devices & services" currently contribute less than 20% to Microsoft's topline, so this isn't exactly a minor shift. However, the challenge of engineering this shift is relatively small compared to the challenge of maintaining OEM relationships that were responsible for Microsoft's success. An integrated "devices and services" strategy could work if a company uses either proprietary or license-free (open source) software, like Apple & Google do. Unfortunately, Microsoft's entire business model with the Windows OS is based on licensing software to OEMs. Continuing this model in the midst of this shift would mean that Microsoft, as a software vendor, would be competing with their own customers (OEMs). With the PC market slowing, this could be a huge risk when OEMs already have another, more established mobile operating system available for free. So what does Microsoft have to say about OEM relationships? Microsoft says they will continue working with OEMs, but says nothing about their current licensing model or about OEM concerns in light of this shift. While OEMs may stick with Microsoft for PCs, slow consumer adoption of Windows-based tablets & smartphones could give them even more of an incentive to dump Microsoft in the mobile segment. If that happens, Microsoft's integrated "devices and services" strategy could fail before it even begins.